Making Fallout 3 has helped Bethesda fine-tune its flagship RPG franchise. 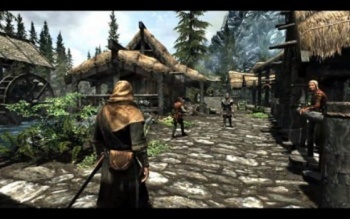 Bethesda Softworks released the last iteration of its Elder Scrolls series of RPGs more than five years ago, which is why the gaming world is so hotly anticipating the release of Skyrim on November 11th. In between, the Maryland-based company wasn't idle, spending time crafting the reboot of a different franchise with Fallout 3. As Game Director at Bethesda, Todd Howard worked on both games, and he thinks that Skyrim will benefit greatly from his experience with Fallout 3. Gone is Oblivion's monster leveling system where all enemies progressed at the same pace that your character did. "Skyrim's a lot more like Fallout 3, where as you level up you are going to see harder things, but the easier things stay around as well." said Howard. "You'll still run into the weaker stuff and you'll just decimate it." The conversation system has also been tweaked. "There's very few completely random conversations," said Howard. "We've gone more towards a system, like we did in Fallout 3, where they have a specific conversation with a specific person about various topics." Lastly, Howard made sure that the open-world was just as strong a vehicle for narrative as the quests. "We realized in Fallout 3 that that kind of environmental storytelling, where you come upon a little scene, is really good," he said. "And so we've tried to do it a lot more." My excitement to play Skyrim is reaching fever pitch. Crap, I need to watch that live-action trailer again.